This article is part of a series of stories on Disability inclusion. 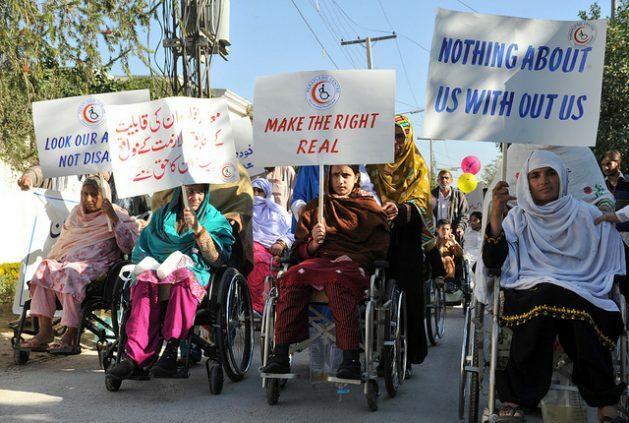 Women with disabilities in Afghanistan protest for their rights. Credit: Ashfaq Yusufzai/IPS. UNITED NATIONS, Aug 13 2018 (IPS) - Children with disabilities are up to four times more likely to experience violence, with girls being the most at risk, according to the United Nations Children’s Fund. “Children with disabilities are among the most marginalised groups in society. If society continues to see the disability before it sees the child, the risk of exclusion and discrimination remains,” Georgina Thompson, a media consultant for UNICEF, told IPS. According to the World Health Organisation, 15 percent of the global population lives with disabilities, making it the largest minority in the world—with children and women numbering higher among those disabled. Last month, more than 700 representatives of non-governmental organisations, private companies and governments got together to address the systemic discrimination that exists against people with disabilities at the Global Disability Summit in London. “Creating a more equal world where children with disabilities have access to the same opportunities as all children is everyone’s responsibility,” Thompson said. More than 300 organisations and governments signed an action plan to implement the U.N. International Convention on Disability, which included 170 commitments from multiple stakeholders to ensure disability inclusion. The summit was organised by the governments of Kenya and the United Kingdom, along with the International Disability Alliance. The most important topics discussed during the meetings included passing laws to protect disabled citizens and promoting access to technology for people with disabilities. Women and children face the most discrimination within the disabled community. A report presented to the U.N. Secretary-General on the situation of women and girls with disabilities stated that while 12 percent of men present a disability, a slightly higher amount of women—19 percent—have a disability. In addition, girls are much less likely to finish primary school than boys, if both present disabilities. And girls are more vulnerable to sexual violence. According to the U.K.’s Department for International Development, mortality for children with disabilities can be as high as 80 percent in states where child mortality has significantly decreased. There is a strong consensus regarding the risk that both children and women face. “Women with disabilities are especially vulnerable to discrimination and violence (three to five times more likely to suffer from violence and abuse that the average [female] population),” André Félix, external communications officer at the European Disability Forum, told IPS. “This would be done across all U.N. Women’s priority areas through our operational responses and internal accessibility to achieve gender equality and empowerment of all women and girls with disabilities,” he said. The aforementioned strategy was one of the goals of the Global Partnership for Assistive Technology, a collaboration launched during the summit to accomplish the sustainable development goals and offer technology to those who with disabilities. “And yet, in low-income countries, only five to 15 percent of those who need assistive technology can obtain it,” Thomson added. And, as 80 percent of the population with disabilities live in developing countries, emergency situations and lack of education are also crucial issues to be addressed when launching policies for disability inclusion. “We must make humanitarian response inclusive. In emergency situations, children with disabilities face a double disadvantage. They face the same dangers as all children in conflicts or natural disasters do, including threats to their health and safety, malnutrition, displacement, loss of education and risk of abuse. “But they also face unique challenges, including lack of mobility because of damaged infrastructure, difficulty fleeing harm and the prejudices that keep them from accessing the urgent assistance they need,” Thompson said. According to the U.N. Educational, Scientific and Cultural Organisation, 90 percent of children who live in developing countries that have educational opportunities available do not attend school. As was seen during the summit, member states are not the only stakeholders taking responsibility for disability inclusion. U.N. agencies, NGOs, and private firms are constantly launching programmes to reduce the gap and erase discrimination. Thompson added that those actors must work so closely that it would be hard to separate roles. The UK Government has led the charge, in the discrimination towards people with disabilities, especially the poor. So, I find it surprising that the Global Disability Summit was held in the UK.